Indulge in a vacation in the seclusion of the Wisconsin northwoods. 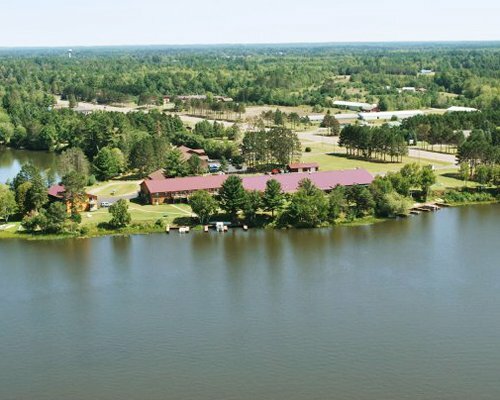 Eagle Pointe is located on the shores of Watersmeet Lake, headwaters to the world's largest continuous chain of 28 lakes, where memories are made and year around fishing is at its best! Relax as you cruise the shores on a pontoon boat or make a splash on the beautiful beaches that line the shores or if you prefer connecting with the water, water skiing, tubing and kayaking are just a few of the activities available at Eagle Point. When you are ready to land, you can enjoy the beautiful sunsets, barbeque on the patio or just enjoy marshmallows on an open campfire. Our three bedroom, three bath units will give you every comfort of home including cable, wi-fi and air conditioning. The units have a full kitchen and sleep a maximum of 8 and 6 privately. The resort provides countless water sports and activities. Kayaks, row boats and life jackets are available for use. Rentals for pontoon boats, jet-skis, etc..are available offsite. In the winter, snowmobile to your heart's content on more than 1,000 miles of the best-groomed trails (guided rides are available). For excellent downhill skiing, Ski Brule is 30 minutes from the resort. Cross-country skiing is nearby. Other attractions in the area are: the beautiful and quaint town of Eagle River, Eagle River Farmers Market, Tribute Brewing Company, Gift Shops, Antique Stores, Craft and Art Fairs, Flea Markets, Snowmoble Capital of the World, Snowbmobile Hall of Fame & Museum, Northwoods Zip Line, Bond Falls, cranbery bog tours and a Casino. Rhinelander/Oneida County Airport is 30 minutes away. From the airport take Hwy 8 East into Rhinelander. Then take Hwy 17 north about 25 miles to Hwy 70 in Eagle River. Then drive East 2 blocks to resort on the North side. Drive through parking lot and check in at the hotel. There are 2 designated parking spaces per unit. Check In time is from 4:00PM to 5:00PM.